Drive to the eastern end of Yosemite Valley and park in Happy Isle Loop parking lot. The YARTS bus can get you closer though! Make sure to check times of buses as you end up at a different place from where you started. 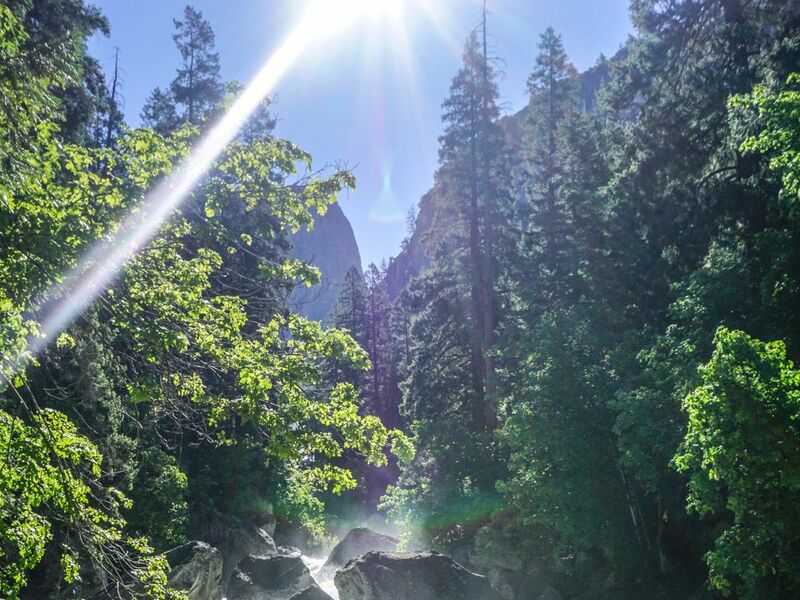 This is one of the most exquisite hikes to do in Yosemite. It’s a long day, however the break at Glacier Point means you can replenish and take a lovely break. 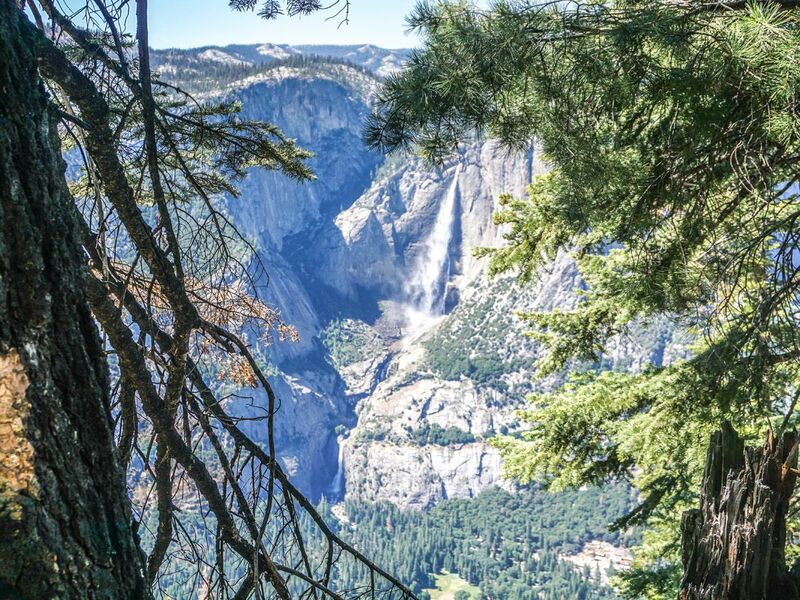 This trail has it all – the mist from the falls, incredible views up and down the valley, and the famous hike down the valley back to Yosemite. 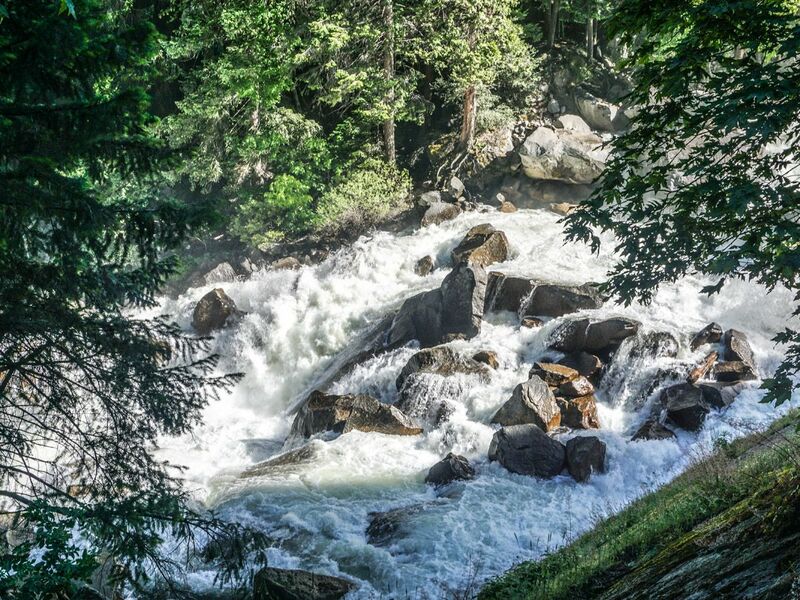 We like going clockwise and starting with the Mist Trail to Vernal and Nevada Falls, as going down the slippery wet rocks is not fun with tired legs. This also places the Glacier Point break towards the end of the hike (approximately 18.0km in), which makes for a good treat after several hours of hiking. 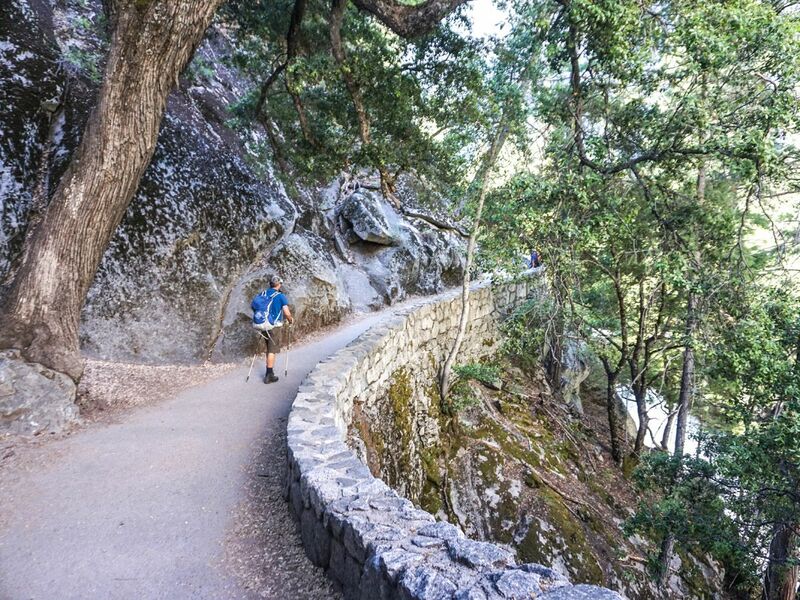 The key to this trail is to either leave your car at the trailhead for 6.4km trail and take the bus to the Vernal/Nevada Falls trailhead or else start early and make sure you’re down to catch the last bus (5pm) that goes from 6.4km trail to Yosemite Village. From there you can catch a connecting bus to Vernal/Nevada Falls trailhead. If you miss the bus to return to your vehicle, you may have to walk an additional 5.0km, pushing the hike over 30 in total. 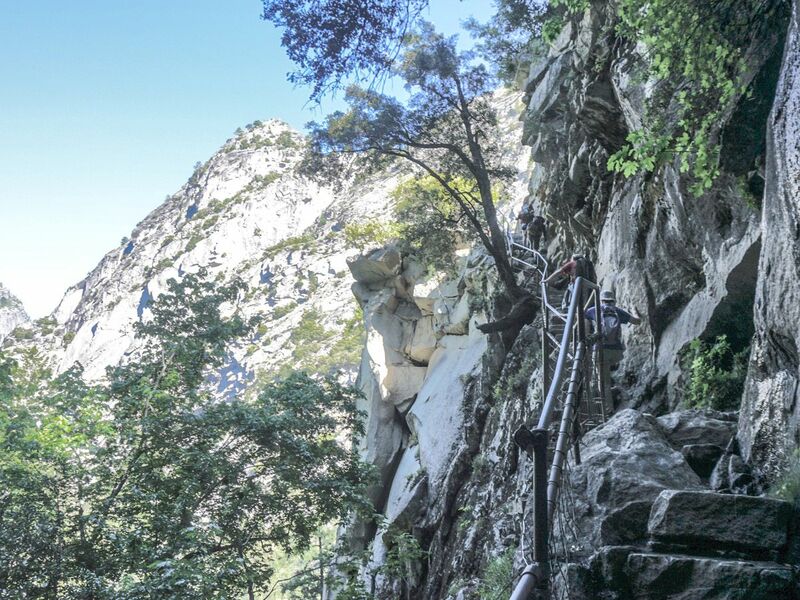 Begin the hike by heading up the world-famous Mist Trail. Follow the signs along the road, passing the campground on your left. The route is very wide the entire way, and is even paved up until the first bridge and the adjacent washrooms.  The path is too steep to take a stroller, however, unless you are an extremely fit parent. 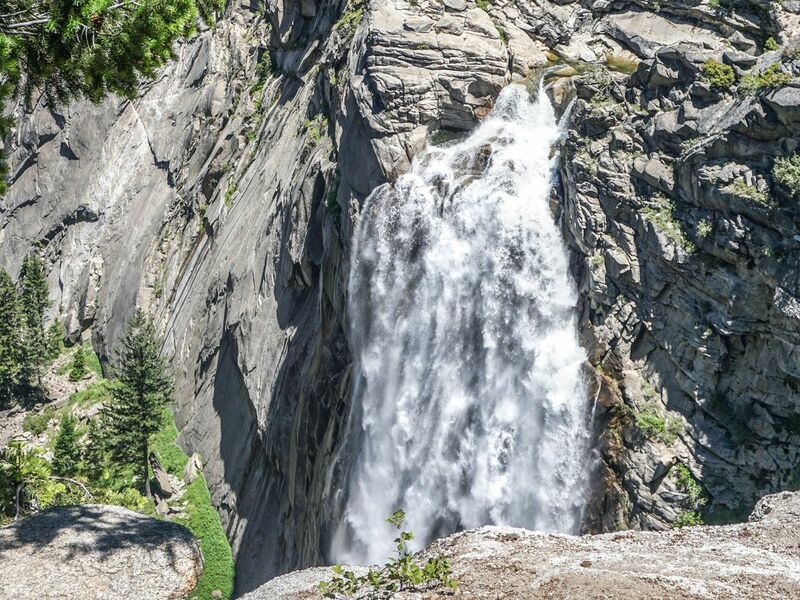 After the bridge you will have views looking up at Vernal Falls as you ascend a steep stone staircase. 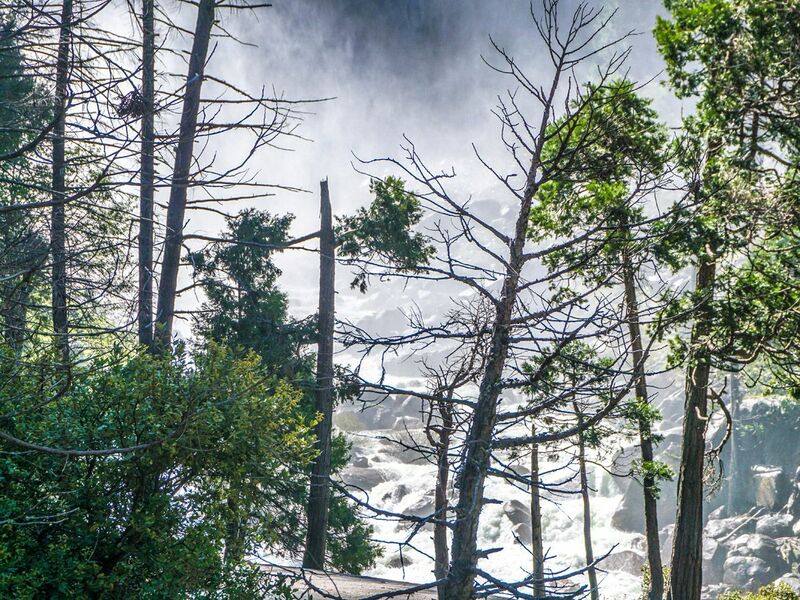 In big snow years the falls can get very wet, and the “mist” turns into a soaking rainstorm. Be prepared to get completely drenched. This is a definite plus on hot days (or on long camping trips without showers) but can be dangerous if doing the hike early or late in the season or in colder weather. From the top, you can look down the gorge and up to Nevada Falls. After Vernal Falls, continue going up some long switchbacks and gain more elevation. The trail is well marked and uneventful. 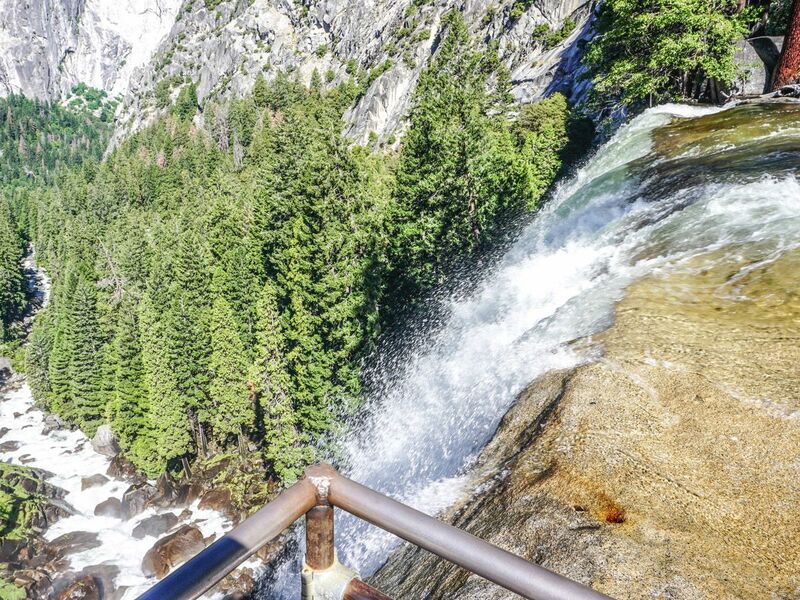 Getting to Nevada Falls gives wonderful views and a great place for a meal in the sun. Coming to the top of the falls you can go left to Half Dome (permit required) however you need to follow the John Muir Trail to get to the Panorama Trail. 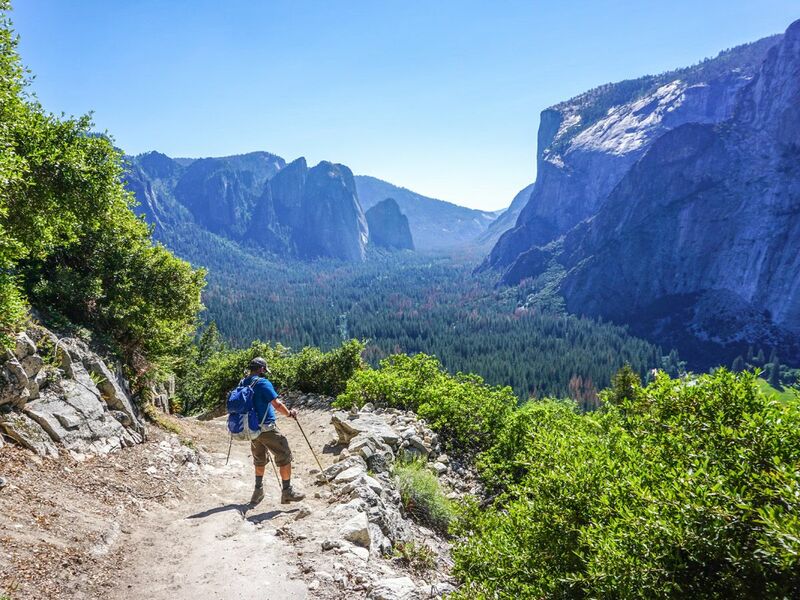 The first climb on the trail is completely shaded and offers beautiful views of Half Dome. You will start to descend in the sun, and once you cross the Illilouette Falls you start to ascend with no shade. This can feel like a furnace on hot days, so take a lot of water. 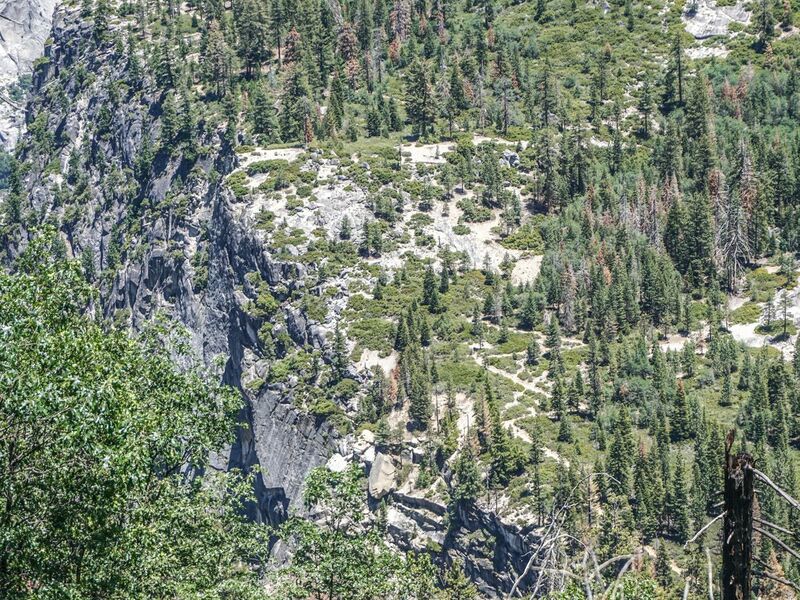 You will climb many switchbacks in the blazing sun and will finally reach Glacier Point, where you can enjoy a delicious cold treat. It’s hard to believe there is path down from Glacier Point when you are below, and the steep switchbacks contour between sheer cliffs to get you down safe. 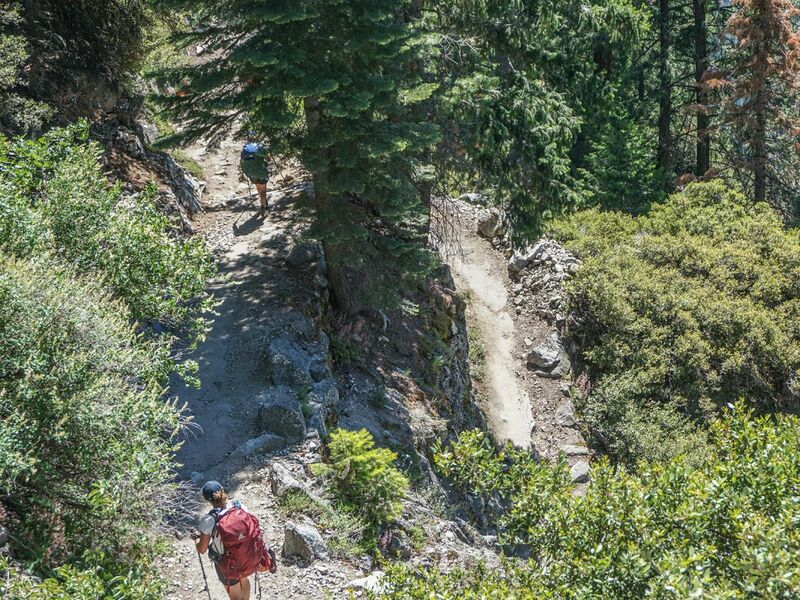 The park is quick to remind you that there is NO other way down, so stay on the trail! 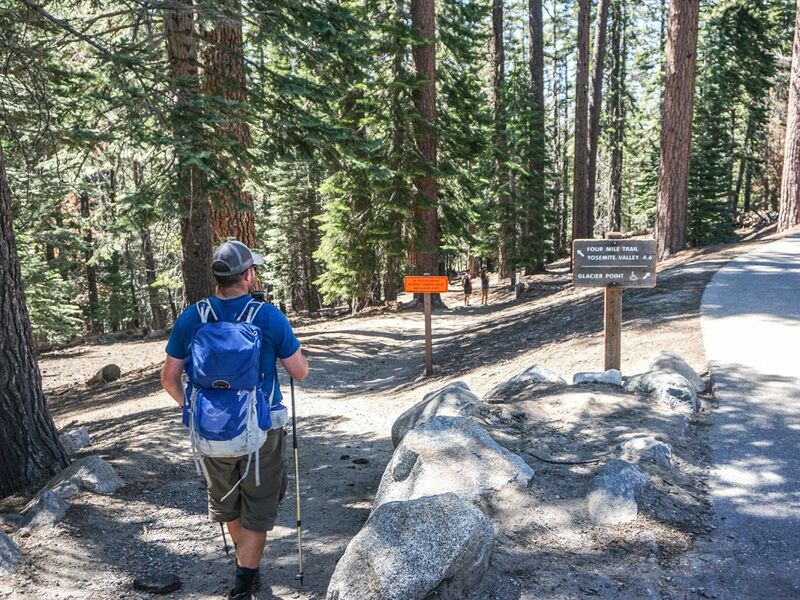 Follow the signs from Glacier Point and begin the descent in a lovely forest, with great views across to Yosemite Falls (Upper and Lower). Fatigue from the day will start to set in, and even though it is downhill, take at least one break going down. It is easy to fall when tired and hot. Most of the descent is, after all, without shade and is sizzling even in the evening. After returning to the valley floor, walk along the trail back to the road where you can catch the bus or find your car. Understand the YARTS bus schedule and make sure you don’t add 5.0km+ at the end of the hike getting back to your car. Get a Deg Muffin from Degnan’s Deli before the day starts. Yum!